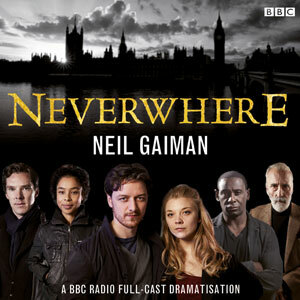 Regular host Fred Greenhalgh stumbles out of the woods of Maine to thank Sibby Wieland and to get cranking on an exclusive interview with Producer Dirk Maggs about the digital download release of the phenomenal audio adaptation of Neverwhere by Neil Gaiman. In between gushing extravagantly about the new show, we talk to Dirk about the pressure about building out and working with an all-star cast, and some of the magic that can happen when you have audio alone to work with. And exactly what are Angel Islington’s wings made out of? Plus chat about the upcoming Hitchhiker’s Live radio tour, with members of the original Hitchhiker’s Guide to the Galaxy on tour throughout the UK this fall.